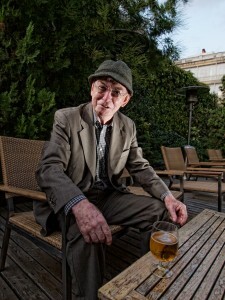 I had to meet Mr Witty at a hotel near plaza Catalunya, the place was full of old German tourists and the vague description I had meant I was sure half the people there could have been him. … Anyway he was a really nice chap, so no harm done. I decided to try and find an outdoor space, I knew if we asked for permission to do pics everyone would run around like headless chickens looking for someone else to make the executive decision and unable to do say would say “no, sorry.” So best option would be a quiet spot. We found a terrace and I set up lights quickly. Eventually someone found us but I instantly ordered a beer and explained it was just a fun shot and basically confused him enough to buy us some time. When he came back later we just ordered another beer; Micheal was happy as he was getting to drink most of it. The lighting is a simple 2 bare head flashes, I only had 1 light stand, so the other is on the table, camera right.